I think it is pretty much apparent from the title that I am obsessed with this city. According to me a person who has lived in Delhi can't live anywhere else in India. The wide roads, flyovers, incredible nexus of metro rail, world class shopping, lip smacking food and the winters are all so addictive! 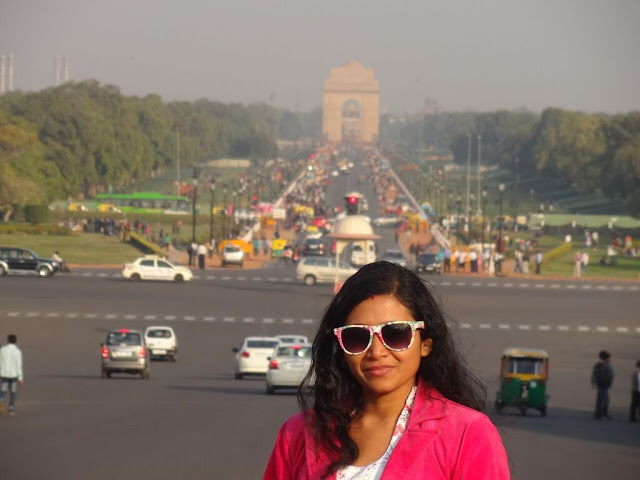 Delhi Is undoubtedly my favourite city! DRIVE: When it comes to 'Drive' the Delhi is THE city. Nowhere else in India you would find eight lane roads and flyovers. The wide roads provide the most ideal way of driving. When you drive in Delhi you feel that no one obeys traffic rules. It is true though to some extent. People don't practise lane driving; don't have patience and road rage is a common phenomena. But as soon as you step (drive) out of this city you realize that Delhi is a much better place to drive. It is one of the very few cities in India where fastening seat belt is compulsory. People actually pay heed to traffic lights. Go to Varanasi or Lucknow or any other city of Uttar Pradesh, people don't know what a seat belt is! Delhi Traffic Police can give you a real scare if you don't behave properly on the road. DESIGN: Sir Edwin Lutyens did a real good job in designing Delhi. New Delhi is impeccable in terms of infrastructure. It is the city of wide roads, flyovers and underpasses. Take the example of ChanakyaPuri. It comes under the NDMC area and is spotlessly clean, has manicured lawns and wide roads. The Ring Road is getting wider day by day and the nexus of metro rail is getting more extensive gradually. There are many points on the Ring Road where four ways cross each other. Take the example of Moolchand crossing. There is an underpass below the Ring Road, a flyover above it and simultaneously the metro track runs above it too! So four ways of different dimensions cross each other! When it comes to architecture, no city can beat Delhi. It is the perfect amalgamation of technology and history. My modern parts have world class buildings while the historical parts have mesmerising monuments. Delhi offers world class shopping centres. Once inside DLF Emporio or Select City Walk, you won't notice any difference between Dubai or Delhi. CONNECT: When a city is so well equipped in terms of design, then good connectivity is inevitable. The public transport system of Delhi is extensive. The Delhi Transport corporation has a huge fleet of low floor AC and non AC buses. The bus system is further enhanced by the Orange Line (cluster buses) which is run privately. In addition to these, chartered buses run all over the city. Delhi is the second city in India after Kolkata to have Metro Rail. The Metro network of Delhi is widening day by day with construction and planning spread over four phases. Every historical/important/business/shopping centre is connected through Metro. Metro rail provides the most comfortable mode of public transport. When you are stuck in a jam, the Metro provides a better way of transport than your AC car. Apart from all this, there are E rickshaws, auto rickshaws and endless cars which are increasing day by day. Delhi has the highest number of cars in India. And why not the rich and the famous reside here. When there are such wide roads and world class architecture and design, Delhi is THE best city to live in India. I never been there but it looks amazing thanks for sharing details.